These High Quality Opals have a Beautiful play of Fiery Colors enhanced by these Vibrant Olive Green Peridots. 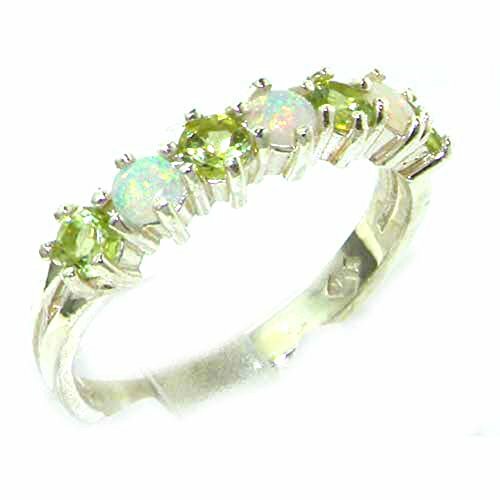 Three Opals & four Peridots equally sized measuring approx 3mm (0.12") round have been hand set in this Sterling Silver Eternity setting. These are Solid Genuine Australian Opals and Natural Peridots. Made completely from Solid English Sterling Silver. This ring has been Fully Hallmarked by the London Assay Office. These markings include, the Royal Lion, 925 and the Leopards Head, being the symbol of the Assay Office. I can not say enough about how lovely this ring is, it looks fantastic especially when worn, the craftmanship is of an extremely high standard and it is a very easy and comfortable ring to wear .